The teapot, as we know it today, derived from ancient Chinese ceramic kettles and wine pots made of bronze and other materials. The oldest teapot that still exists today is the one made in 1513 from Yixing clay by Gongchun. It is kept in Hong Kong Flagstaff House Museum of Tea Ware. From the end of 17th century tea and porcelain teapots were shipped from China to Europe. Most of those teapots were painted in blue and white underglaze. It means that the decoration was put to the surface before it is glaze. First porcelain similar to the Chinese was produced in 1765 by William Cookworthy in Plymouth, UK. Interesting! 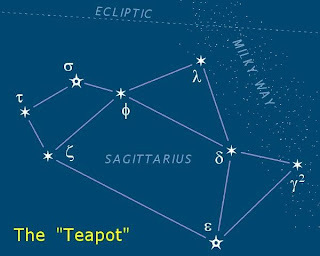 I never even thought about sagittarius looking like a teapot hmmmmm.